HomeFashion / LifestyleWhy Half Sarees and Bhagalpuri Sarees Are So Famous? The unstitched fabric called “saree” is true artistic charm of Indian Creative minds. On the ground and soil of this country, daily artisans fuel in special efforts in weaving of these sarees. India is a rich country in textiles. Saree is an outfit which is adorned beautifully and gives an Indian look with modern touch. The sarees in India are weaved with lot of love and care in every region by different fabrics, designs and patterns. Today we will be telling you about the famous half sarees and Bhagalpuri sarees. The fashion of half sarees has derived from South India. This renowned style is famous worldwide and loved by many fashionistas. Even bollywood celebrities love this style of saree. Right from Deepika Padukode to Alia Bhatt are seen in this type of saree for their respective movies like 2 states and Chennai Express and they looked stunning. In South India Langavoni/Davoni which is also called half saree is a traditional costume. It is a skirt with a blouse and a dupatta. It is worn by teenage girls and it is believed that when a girl is no longer a child and enters into teenage she should wear this type of saree. As teenage is a period when girls are into a state where there is no longer a child or an adult. So they have to wear this type of saree in a place of full saree. From Where You Should Buy Half Sarees? 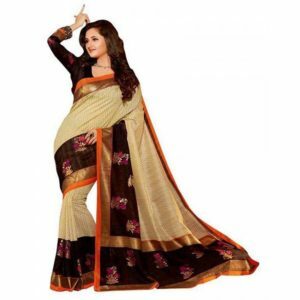 Makemyorders.com is a best destination if you want to buy half sarees online. This online portal showcases all exclusive and trendy. Earlier half saree was a simple 3 piece dress which used to come in fabrics like cotton or chiffon. But nowadays as people have become fashionable and looking forward to get vide range of colors. It comes in various good fabrics, designs, embroidery. They are available in many good and bright colours. The skirt comes with a great flare with a blouse which is very attractive and a heavy dupatta. The dupatta is draped in a style of saree. The best things are they give a look of saree but are very easy to carry. You can also buy a half saree in contrasting colours which will look awesome. The most recent half sarees come with an embroidery work on it which can be worn on parties or any functions. The fabrics play an important role in embellishing your half saree. Why Bhagalpuri sarees are popular? Today we will be sharing information about Bhagalpuri sarees and why they are so popular? Bhagalpuri fabric is very good and the sarees come with beautiful designs and patterns. The innovation of these sarees came from Bhagalpur. These silk sarees are also famous as Tussar silk sarees. These sarees are weaved in special kind of silk which gives a saree an appealing look. They are not only famous in India but also in other parts of the world. Bhagalpuri sarees go well on all age group of women and looks very trendy. These sarees are very easy to carry and comfortable due to light weight cotton mixed silk fabric. Wanna buy bhagalpuri sarees online? You can get best bhagalpuri sarees online @ Makemyorders too in types of shades, designs and prints.